Adding the ability to save & share your high score via Twitter or Facebook, is a great to make social gaming apps more viral. 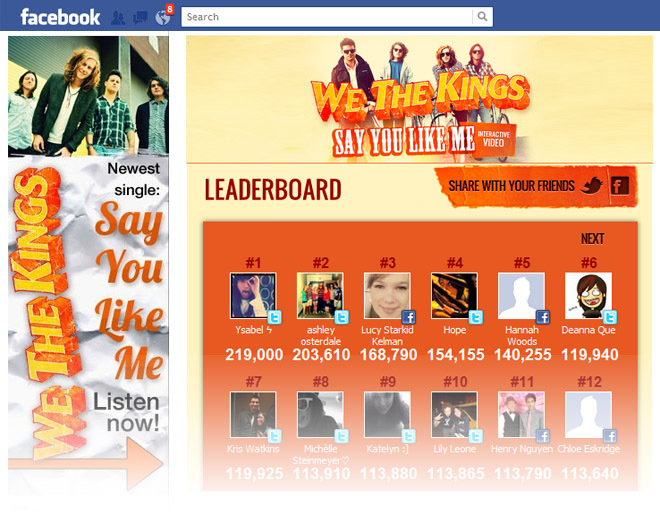 We recently added a social media score board and sharing capabilities to the interactive video and game from We The Kings. We worked with S-Curve’s video partners to integrate the sharing functionality directly into the We The Kings video/video game. Users who successfully played the game were able to share their high scores to the leader board via Twitter or Facebook. The sharing application forced players to share their score (through the social media channel of their choice) in order to get on the leaderboard. We also create an iframe version of the leaderboard that was accessible through the band’s website. You can try the game for yourself by clicking here.